If you’re unfamiliar with Espers, we strongly recommend heading on over to Part 1 of our ultimate guide to small market cap cryptocurrencies and reading up on Espers’ fundamentals and mission. If that’s too much to do, don’t worry, here’s a little recap of Espers – a project bringing secured messaging and websites to the blockchain. Secure messaging: to eliminate unwelcome and illicit surveillance user messages through broken down and stylized textual data, images, and other information. Espers’ messaging system tackles everything from basic images to compressed documents and files. File storage & websites on the blockchain: hosting, storage, and maintenance of websites and other files on the blockchain, creating a “new standard for website safety and security,” while ensuring website permanence (a novel feature in today’s highly censored Internet landscape). Modular sidechains & cross-chain interfacing: independent sidechains which employ cross-chain interfaces to share and distribute work, sanctioning the combination of various projects (important for alleviating network collapse and bloat). If you’re still wondering more about Espers and where to buy it, head on over to their website and brush up on their white paper. Now, let’s say you’ve picked up a bag of Espers ($ESP), and are wondering where to store it. For starters, the Espers wallet is compatible with Windows, Mac, and Linux setups, however, this article is tackling its easy-to-use web wallet. 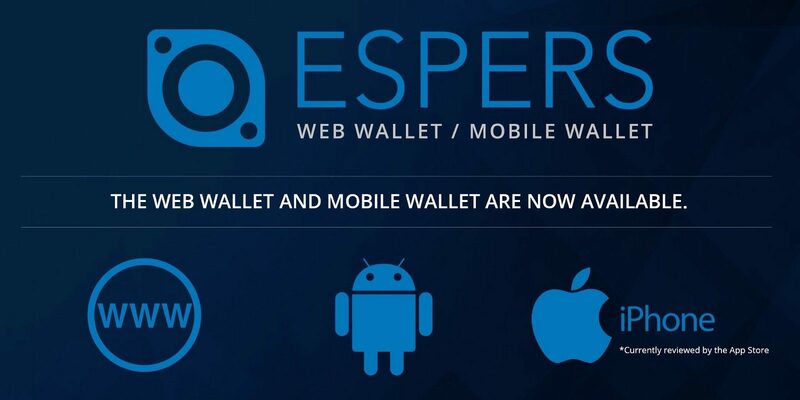 In late-April of 2018, Espers rolled out their web and mobile wallets, helping ease the storage of Espers for its users. Both wallets were created in furtherance of enabling ESP holders to easily access their coins without having to download, sync, and maintain a local Espers Node – a true step towards mass adoption. After selecting “New Wallet,” you’ll be provided with your private key, which you should make sure to safely backup and keep written down offline. Espers cautions users not to store large amounts of ESP in this wallet, as it still is a web wallet and not as secure as the desktop wallets. And, once your wallet is open, you can start sending and receiving Espers! Note that staking is currently only available for traditional Espers wallets, however they have noted that web and mobile staking is planned. Sending and receiving ESP with the web wallet is extremely user-friendly, and merely requires a user to input the address they are sending to, and total amount of Espers they want to send. Once you’ve entered the address and amount of Espers you want to send, you’ll have a transaction ID which is generated, which you may then enter into the Espers blockchain explorer to monitor your transaction. Always make sure to double-check the address and amount you are sending before executing a transaction. Note that the other Espers block explorer – https://espv2.miningalts.com/ – has stopped registering transactions as of January 15, 2019, but may be up in the near future. If you’re in search of a blockchain project with a dedicated and transparent team, easy-to-use features, and a plan to further the free flow and permanence of information in an otherwise censored age, consider checking out Espers and downloading their web wallet. Once again, you can read up further on Espers by checking out our five part guide to small market capitalization cryptocurrencies! Finally, if you’re looking to stay in the loop about what Espers has in store for 2019, check out their blog or follow them on Twitter.